A parachute is a device which is designed to slow descent by providing drag, causing the falling object to slow down. Parachutes are used for both people and cargo, and they have a range of applications, from recreational parachuting to delivery of humanitarian relief in areas which can only be reached by aircraft. There are also a number of different types of parachutes designed for specific applications. n its basic sense, a parachute is neither made for travel and sports, it was created to increase safety while descending from a certain altitude. It is a medium to delay the pull of gravity from earth when deployed form higher altitude. In short, it makes the dropping of an item, a person or equipment vertically or diagonally slower by reducing the amount of dragging force while maintaining a balance so that the item would remain safe until it reaches the ground. Early physicists have made use of this principle and newer develops in parachuting technology led to the creation of various types of parachutes. Parasol type- Though not strictly called parachutes, the parasols were commonly used by performers in China to create a slow falling effect onstage. Conical parachute” Possibly the earliest form of parachute is the conical shaped-parachute which appeared during 1470s in Italy preceding the design conceptualized by Leonardo da Vinci. As an escape device, this type of parachute was intended to allow people to get safely on the ground from burning buildings. However, there are no written records whether this parachute was ever used for that purpose. Pyramid Parachute: Another design by Leonardo da Vinci, this parachute was conceptualized in Milan during the early part of 1480. It was a canopy that is supported by light wood held by a square bottom frame. Pack-style parachute: This is the predecessor of all parachutes that are stored in casings these days. Round parachutes: A basic drag device, round parachute is used in various settings like medical missions, cargo applications and military operations. While being described commonly as round in shape, the parachute actually resembles a dome or a jellyfish. This has been among the most popular type however; present-day parachutists don’t normally use this kind of parachute. The earliest round parachutes were circulars with flat surfaces that made them unstable, thus causing a number of deaths and injuries on parachutists. To add more stability, military round parachutes were made parabolic or conical in shape. There are two types of round parachutes- steerable and non-steerable. Like ram-air parachutes, non-steerable parachutes can’t be maneuvered to intended direction thus this type glides only to the direction of the wind lending no control to the parachutists. However, steering is provided through cutting large holes in the edges giving relatively partial forward speed. Square parachutes: The cruciform design helps reduce oscillation. It is commonly used today by sport skydivers. 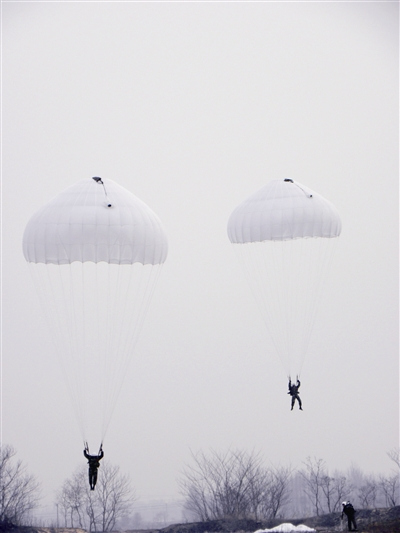 Ram-air parachutes: For better control of speed and direction, ram-air parachutes allow the canopies to self-inflate. Like standard paragliders, ram-air parachutes are designed to hold, spread and lessen the tension of parachute deployment on terminal velocity. Ribbon/Ring Parachute: Specifically designed for supersonic speeds where ordinary parachutes would break down, this type often has a hole in the middle of the canopy to lessen the pressure as the parachute reaches the ground. The ringslot parachute was developed in 1951 at Wright Field as a low cost replacement of the ribbon parachute. The ringslot parachute is used today on several US and foreign fighter aircraft. 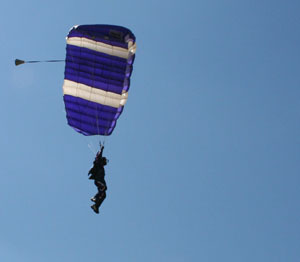 Several foreign countries use the Cross parachute. The Cross parachute is employed in the US as a drag brake for automobile dragsters. A varied porosity version of the conical ribbon parachute type, using continuous ribbons, has been introduced as an aircraft drag parachute. The Cross and the varied porosity parachutes have the same drag as a ringslot parachute of equivalent size but have a slightly higher opening load factor. The Cross parachute is relatively inexpensive to manufacture. On some designs, the ring of the canopy is broken into a number of ribbons that are connected by ropes so as to allow more air to pass. The leaks in between the ribbons will diminish the pressure on the parachute so that breaking or shredding of the canopy is prevented. A parafoil is a parachute-like device that can be steered, used especially in kites and paragliders. A parafoil is a fully soft inflatable wing, which are familiar in the sports of hang gliding and parachuting. This system is designed to retard the vertical velocity and provide a relatively soft touchdown. The lifting parafoil has three advantages over the conventional type: 1) being able to reduce the dispersions associated with trajectories by using its maneuverability to glide to a predetermined point, 2) having the capability of being manually controlled to minimize landing area impact dispersions and, 3) by flairing, to reduce the impact shock at touchdown. The advantages of a conventional parachute are reduced weight and less complexity. If a parafoil is deployed at an altitude of approximately 6000 meters, typical performance characteristics provide a maneuvering circle of about 16 km in radius. These various types of parachutes are made according to the use they have and some are according to the technology the inventors had during their time.